Is it Time to Consider a Drop Trailer Program? Is it time for your business to consider a drop trailer and / or drop and hook freight program? The current capacity crunch and driver shortage has caused serious issues in many businesses’ supply chains and has increased the demand for drop trailer and drop and hook shipping programs. What is a drop trailer program? It is when a carrier brings a tractor to the loading dock and picks up a previously loaded trailer. Drop and hook takes drop trailer shipping one step further. A carrier will arrive with an empty trailer to drop, pick up a loaded trailer, and continue on to the destination. Many shippers are now considering drop trailer programs mainly because of the new hours of service rules issued by the Federal Motor Carrier Safety Administration (FMCSA) which are more strictly monitored by the ELD mandate. Before the change to the hours of service rules, if a driver waited three or four hours or more while their trailer was loaded, they could make up the time by driving more hours. Now, with an ELD required for every tractor, load time and detention is a significant consideration because it cuts into the 14-hour on-duty shift rule. To illustrate, if a carrier has to drive an hour to the shipping origin, then wait five hours to get loaded, that means he can only drive for 8 hours after leaving for the destination. If he averages 60 mph, he can travel 480 miles. If the same driver picked up a loaded trailer, he could drive 10 hours before reaching the 11-hour driving limit. If he averages 60 mph, he can travel 600 miles. A drop trailer program can also have a significant impact on the efficiency of your supply chain. 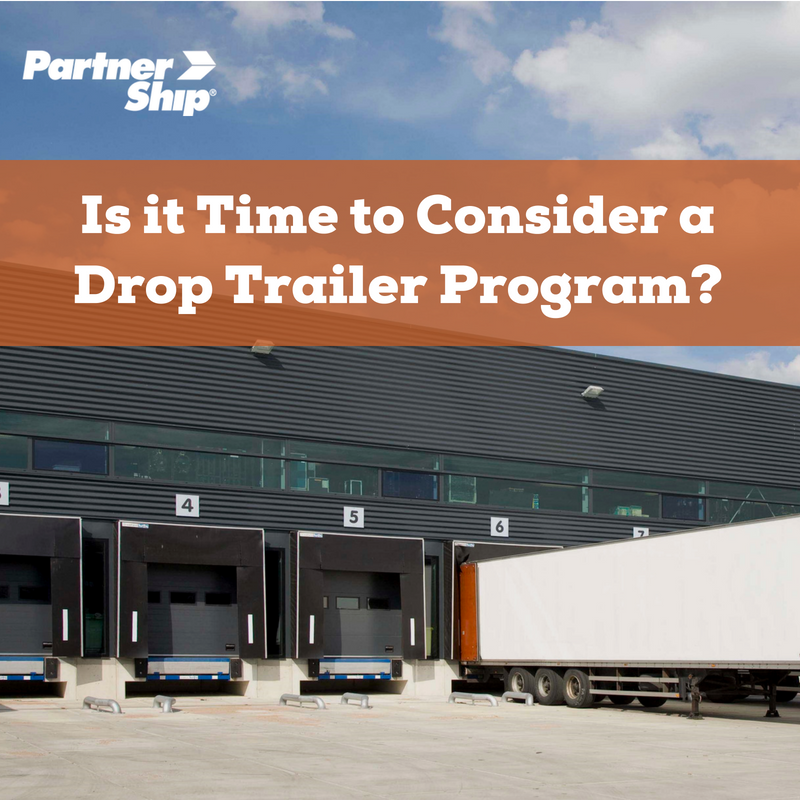 Drop trailer programs help shippers and carriers plan more effectively for deliveries and outbound shipments so it is important for them to align their schedules. Without drop trailers, a carrier must arrive within a narrow appointment window for employees to load or unload the trailer. Depending on how the appointment fits into their on-duty schedule, and considering traffic conditions, weather, breakdowns and other unexpected events, the driver could be forced to wait for hours, or miss the appointment altogether. In these situations, late delivery fees, detention fees, and a negative vendor scorecard are typically the unpleasant results. Smoother supply chain operation. You can load or unload a trailer at your convenience or when staffing levels are adequate; no more paying overtime to load or unload when a truck is early or late. Great for time-consuming loads, like floor-loaded freight. Avoid costly driver or truck detention accessorial charges. Higher on-time delivery percentages. On-time freight departure times substantially increase the odds of an on-time arrival. Decrease fines. With strict retail Must Arrive By Date (MABD) requirements becoming more common, drop-trailer shipping can help your carrier arrive on time and minimize the fines associated with missing a delivery window. Better retailer relationships. When you fulfill MABD requirements, your vendor scorecard improves and you are seen as a more desirable vendor partner. Better planning. You decide when you pick up (and drop off) trailers. No more waiting to pick up a load or be live-loaded; spend more time driving to the destination. There are a few circumstances of which to be aware when considering a drop trailer program. There may be an initial cost to implement a program. Every trailer that a carrier takes out of over-the-road service is lost revenue, so to recoup it, there will be a cost for a drop trailer, either on the front end or back end (or both). Of course, this cost will pay for itself because there should never be any detention fees. Drop trailers should not become warehouses; the maximum time a trailer should sit is a week. In most drop trailer programs, trailers turn two or three times a week. Finally, there is a lot of up-front work to implement a drop trailer program. Not all carriers do drop trailers so finding one that does can be time-consuming. Trailers make carriers money so if one of your carriers doesn’t want to drop a trailer, simply look at using a different one. A drop trailer or drop and hook program is a perfect opportunity to use a freight broker. Working with a broker allows you to tap into their network of carriers and take advantage of their expertise in finding carriers that will drop trailers. The truckload shipping experts at PartnerShip will work with you to find a drop trailer or drop and hook carrier and get you the best freight rates possible. We know the lanes, we know the rates and we will help you ship smarter. Contact us today to learn more about setting up a drop trailer program!